Could the U.S. Navy Destroy North Korea? The navy can contribute to a joint or multinational campaign that destroys the Northern regime or its armed forces. The navy can contribute to a joint or multinational campaign that destroys the Northern regime or its armed forces. But even that would involve perils, hardships and steep costs. It bears noting at the outset that destroy is a loaded term, connoting wholesale slaughter of a foe. It need not be so. For martial sage Carl von Clausewitz , destroying an opposing force means incapacitating it as a fighting force. “The fighting forces must be destroyed,” insists Clausewitz; “that is, they must be put in such a condition that they can no longer carry on the fight.” Disabling a hostile regime so it cannot resist our demands would likewise qualify. So it’s possible to overcome an antagonist with minimal loss of life and treasure to both contenders. Indeed, it’s highly desirable, as China’s strategist Sun Tzu  counsels. The “best policy,” advises Master Sun, “is to take a state intact,” and to do so without bankrupting your own treasury and wasting the flower of your military youth. Such forbearance is hard to pull off amid the clangor of combat, but it constitutes an ideal to strive toward. In 1940, for example, German legions destroyed the French Army as a fighting force along the Meuse while inflicting minimal destruction by physical measures. It can be done. Onward. Let’s proceed down the scale of violence, beginning with strategic nuclear strikes and ending with interdiction of shipping and air traffic bound to or from the North. First, start with the trivial case , namely submarine-launched ballistic missiles (SLBMs) disgorged from Ohio-class fleet ballistic-missile subs  (SSBNs) or, someday, their Columbia-class successors . Full-scale atomic bombardment would end the North Korean military and government beyond question. After all, the keystone of strategic deterrence is an invulnerable second-strike force. That refers to an arsenal of nuclear weapons certain to survive an enemy first strike, thence to rain down fire and fury  on the offender afterward. SSBNs represent the quintessential retaliatory force. Fleet boats rotate out on patrol all the time. Having ridden out the attack, U.S. SSBN skippers would fire their missiles—setting ablaze an inferno sure to consume the attacker. Any nonsuicidal foe would desist from aggression rather than roll the iron dice. Using SLBMs or other strategic nuclear weapons for first strikes would gut the logic of deterrence—and set a grim precedent in future controversies involving major opponents like China or Russia. Therefore, no president would or should take that step. QED . But tactical strikes aren’t a near-term option for technical reasons. President George H. W. Bush ordered tactical nukes withdrawn  from seagoing forces in 1991 (eliciting cheers from those of us who handled them). Now, the Trump administration may reverse Bush’s decision. Officialdom is putting the finishing touches on a new Nuclear Posture Review  that may espouse new sea-launched tactical nukes. Leaked copies of the review indicate that a nuclear-tipped cruise missile may indeed be in the offing. Still, decreeing that a weapon system should exist doesn’t bring that system into being overnight. Lawmakers have to debate and approve it—always a fractious process when it comes to doomsday weaponry. Contracts have to be negotiated with munitions makers. Hardware and software have to be developed. The system has to be built, tested under realistic conditions, refined afterward in keeping with the test results, and manufactured and deployed to the fleet. That takes time. Back in 2009, for example, the U.S. Navy prevailed on industry  to develop a new long-range antiship missile (LRASM). The new “bird” is a modified version of a working missile , yet only this year is it ready to be fitted aboard U.S. Air Force B-1 bombers (give ‘em the gun! ). Only next year—ten years after the initial request—will it be deployed aboard navy warplanes. And that’s a sprightly pace by Pentagon standards . By the LRASM standard we might see nuclear-tipped cruise missiles in the fleet circa 2027–28 if the administration gets congressional assent and funding this election year. Kim Jong-un is not sweating at the prospect of tactical atomic strikes from the sea. If not nuclear weapons, then what? Let’s ask the English sea-power scribe Julian Corbett . Corbett partitions naval warfare into three basic phases: disputing maritime command if you’re the weaker antagonist, winning command if you’re stronger and exploiting command after the battle is won. We can set aside the first two phases. America and its allies will command Northeast Asian waters against North Korea’s feeble navy and air force unless they botch things dreadfully. That leaves putting the sea to work as an offshore safe haven. In Corbett’s scheme, thirdly, conventional shore bombardment constitutes an option. Carrier strike groups  tote an array of bombs and cruise missiles suitable for peppering North Korean targets. Yet it’s doubtful in the extreme that conventional fire would compel Pyongyang to abandon its fledgling nuclear stockpile, let alone terminate the regime or its armed forces altogether. Denizens of the hive of scum and villainy  learned a lesson from Desert Storm and the ensuing campaign to disarm Saddam Hussein’s Iraq. Namely, dig. If you want to develop unconventional armaments, that is, dig in—hardening weapons laboratories and deployment sites against American air and missile power. With its rough, rocky, mountainous terrain, North Korea enjoys ample places to tunnel—and to all appearances Kim’s army has done so. A mountain fastness will prove resilient even against precision firepower. Air and sea power alone couldn’t defeat North Korea and its Chinese patron during the Korean War. Nor is it likely that U.S. Navy carrier groups carry enough ordnance to subdue North Korea today. And even if they do, it would take preternatural operational and tactical dexterity to put ordnance on the right targets at the right times to defeat the North. But fourth, navy task forces could do what dominant marine powers have always done. They could cordon off the Korean Peninsula from seaward while preventing an unlimited counterstroke against the American homeland. U.S. Navy air, surface, and subsurface forces would interdict all sea and air traffic around the peninsula, while Aegis cruisers and destroyers equipped for ballistic-missile defense would bring down any strike aimed at Guam, Hawaii or North America. Safeguarding South Korea and Japan, home to forward-deployed U.S. forces, would be a corollary to this defensive effort. Doing so would create favorable conditions for U.S. Army and Marine Corps forces to stage a ground offensive. Corbett depicts Korea as the ideal theater for such an amphibious campaign, flanked as it is by water on three sides. Such a strategy could work if allies consent and if the United States values its cause enough to spend lavishly in lives, military hardware and national treasure for a substantial period of time. Newport’s own strategist, Admiral J. C. Wylie, warns  that destroying things on the ground from aloft does not confer control of that ground—and control represents the paramount purpose of military strategy. Rather, says Wylie, the “man on the scene with a gun”—or in this case, enough soldiers on the scene with guns to outmatch the North Korean Army—represents the arbiter of victory. The soldier determines who wins and loses. Wylie and Corbett, accordingly, would profess extreme skepticism that the U.S. Navy could incapacitate North Korea short of a concerted ground, air, and naval offensive—preferably in consort with Asian partners. And in fact, Corbett’s logic starts breaking down north of the narrow waist  midway up the Korean Peninsula, roughly coinciding with the inter-Korean border. The peninsula widens as you proceed northward from the narrow waist—and geography demands that attacking warbirds operate across greater and greater ranges while exposed to ground fire and hostile aircraft. 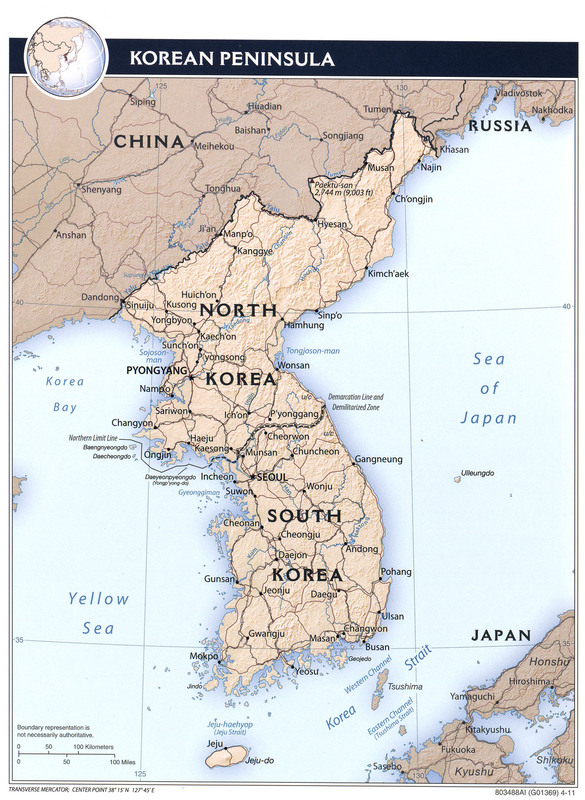 And, of course, North Korea shares a long, distended frontier with China and Russia. That’s a frontier that must be sealed to isolate the battleground, yet can’t be sealed by naval aviation. The border can only be sealed by Beijing and Moscow—dubious partners at best in the Korean standoff. That grants Pyongyang an opportunity for mischief-making. In short, it will be hard to crush North Korea’s armed forces, even if Washington orders a joint offensive. And lastly, to swerve back to purely saltwater campaigns, there’s the least violent option: a full-bore naval blockade of the peninsula. Enforced with vigor and sufficient assets, a blockade would deprive North Korea of imported fuel, foodstuffs, and other commodities the beleaguered country must have to survive and fight. It would also balk Pyongyang’s efforts to export weapons, the makings of weapons, and bomb-making expertise to earn hard currency. Corbett observes that a navy can apply pressure on a foe’s “national life” from day one of a conflict. Over time, he writes, it could exhaust that foe gradually—laying him low. But again, naval forces can only perform their blocking function at sea. They have little way to obstruct overland transit across North Korea’s northern border unless Washington wants to risk tangling with Chinese or Russian forces, and escalating a local conflagration to great-power war. Few relish that prospect. It’s a safe bet, then, that any blockade would leak to one degree or another. As it was in the 1950s, so it is now. Sea power furnishes the Trump administration military options in its confrontation with North Korea, but none of them promises easy, quick, or painless results. Thankfully, this is not lost on high-ranking defense officials. Secretary of Defense Jim Mattis, to name one, is reportedly a fan of Fehrenbach’s treatise. Indeed, General Mattis recently quoted him  while holding forth on how a second Korean War would unfold. That’s good. It betokens strategic sobriety and humility—virtues any commander should cultivate. James Holmes  is the inaugural holder of the J. C. Wylie Chair of Maritime Strategy at the Naval War College and contributing coeditor of Strategy in the Second Nuclear Age . The views voiced here are his alone.